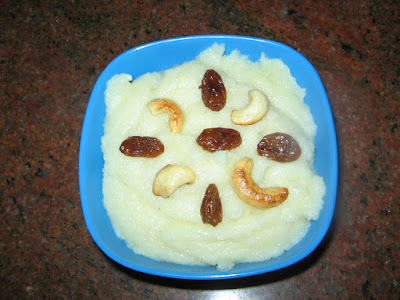 The recipe is same as annavaram swami prasadam. and we use sugar instead of jaggery. It takes less than half of the time in preparing it when compared to cracked wheat prasadam..
U may add upto 1 cup if not calorie conscious. upto 5 mins if roasted in low flame.. Keep it aside. stirring it .Let it simmer for a few mins,cover with a lid. raisins,mix well and switch off. Photo follows in a day.